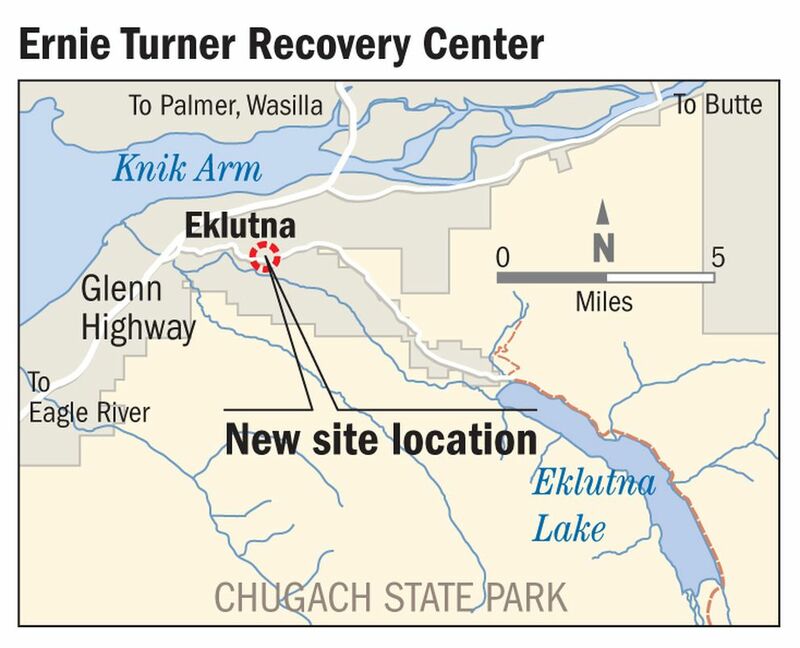 Anchorage-based nonprofit Cook Inlet Tribal Council plans to open a new residential addiction treatment center on a rural, forested tract on the road to Eklutna Lake, a reincarnation of the Ernie Turner Center, located now on busy, noisy Tudor Road. Called the "Ernie Turner Center — Recovery Journey Program," the new building will have 16 beds for short-term and long-term addiction patients. CITC is one of the partners on the project, along with Cook Inlet Housing Authority, a nonprofit housing developer, and Eklutna Inc., the Native village corporation and landowner. The 6-acre parcel on Eklutna Lake Road is located next to the Eklutna Water Treatment Facility and close to a few homes on large lots. Officials say the serene environment was appealing. "That health piece — not just treatment but looking at the whole person — that's a struggle sometimes right in town," said Rebecca Ling, director of recovery services for the tribal council. For more than two decades, CITC has run its addiction treatment program out of the first floor of a building on the corner of Tudor and Elmore roads. The council and Southcentral Foundation used to share management of the Ernie Turner Center, located on the second floor of the building, a 14-bed detox program that cares for people withdrawing from alcohol or drugs. Ernie Turner himself was born in Shageluk, near the Yukon River. He developed an alcohol addiction in Washington state and became a Seattle street drunk until he underwent successful treatment in 1968. From 1971 until his death in 2010 from cancer at age 80, he worked at setting up treatment centers in the Seattle area and Anchorage geared to Native Alaskans and Native Americans. In January, Southcentral Foundation took over management of the detox program, a few months after buying the building from the council. The detox program will stay at the Tudor building, said April Kyle, vice president of the behavioral services division at Southcentral. She said the foundation hasn't yet decided what the first floor will become once the space is vacant. The Ernie Turner Center name will move to Eklutna along with the program, Kyle said. Ling said there are advantages to the Tudor location, like easy access to city hospitals. But she said there are also confidentiality issues, as well as a more chaotic urban environment. The new location will be close to trails, Eklutna Lake and activities like horseback riding, Ling said. "The establishment of the Center at this place on Eklutna Lake Road provides a beautiful peaceful setting with trails and healthful activities," officials wrote in the application. The plans include an exercise room, arts and crafts room and carving studio. The facility is organized around traditional tribal concepts — there is a family chief and clients are referred to as family members. People who enter the program are "stringently screened" first, according to the project application, and have gone through detox. Over the years, the approach has reported strong results: After six months, 86 percent of residential graduates have reported a reduction in harmful behaviors, according to the project application. Nearly all the graduates get jobs after finishing the program. Because the center also accepts ex-offenders entering treatment as a condition of their parole, the facility is technically considered a community correctional residential center, or halfway house. In January, the Eklutna Valley Community Council passed a resolution offering preliminary support for the project. Some land-use designations have to change first. The municipality's Planning and Zoning Commission is reviewing the project plans on Monday, and the Anchorage Assembly is slated to consider a rezone request at its Tuesday meeting. Ling said the nonprofit expects to open the new center by the start of next summer.